Matthew’s newest television series, Girlfriends, will be premiering in the US on Acorn.tv on Monday, January 29th 2018. The first two episodes of the six-part drama will be available on the 29th and Acorn will release one episode per week after that. Girlfriends stars Zoë Wanamaker, Miranda Richardson and Phyllis Logan with Matthew playing the son of Wanamaker’s character Gail Stanley. Girlfriends is currently airing in the UK at 9pm, Wednesdays on ITV. Wanamaker) house with his young son Ben in tow. However, Tom’s frequent clashes with stepfather Dave (Adrian Rawlins) was a contributing factor in Gail and Dave’s divorce, particularly when Tom’s wide boy ways, penchant for petty crime and subsequent imprisonment led him to leave mum Gail holding the baby. Acorn TV has your favorite British mysteries, comedies, dramas and more, all commercial-free and on demand. All you need is a computer, iPad, iPhone, Apple TV, Samsung Smart TV, or Roku to watch anywhere, anytime. Sign up for a FREE trial at http://acorn.tv! Some new promotional photos from the show have also been released. View those in the gallery! A clip of Matthew in the show may be watched over at The Sun. We will add it to this post if one becomes embeddable. Video: Preview of Matthew Lewis in ‘Girlfriends;’ Plus Date Announced! stepfather Dave (Adrian Rawlins) was a contributing factor in Gail and Dave’s divorce, particularly when Tom’s wide boy ways, penchant for petty crime and subsequent imprisonment led him to leave mum Gail holding the baby. The final night of Linda and Micky’s celebratory wedding anniversary cruise takes an unexpected turn, changing their lives and that of their children forever. With her world turned upside down, back home Linda turns to life-long friends Sue and Gail for support as she struggles to cope. When she discovers the depressing reality of the family’s badly managed finances, Linda fears for the future, but the girlfriends are horrified to learn there may be bigger problems in store for their friend. Meanwhile overburdened Gail is juggling caring for her aging mother and looking after her demanding grandson as she anxiously prepares for her son Tom’s release from prison. With her divorce to her second husband Dave nearing completion; an unwanted letter causes Gail to face her true feelings. But is it too late for her to do anything about it? When high-flying Sue gets a call from her PA she’s not prepared for the devastating news facing her at work. As the future of her career as the high-powered Feature’s Editor of the bridal magazine is thrown into question, Sue’s horrified by the realisation this may have more to do with her age than her performance at work. After committing her best years to her career and to her married lover and business partner John, Sue starts to question the choices she’s made. Thanks to AccioMDL for the embed! Matthew Lewis has reportedly been cast in ITV’s Girlfriends alongside some fellow Potter alumni. 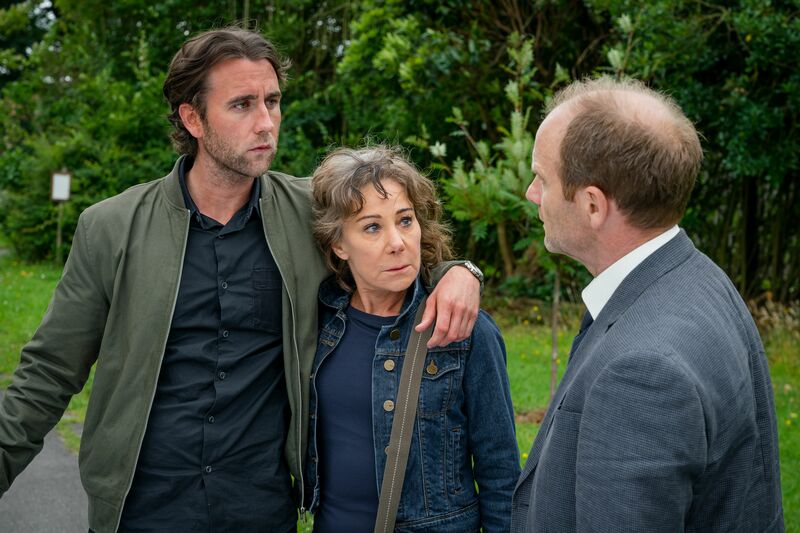 The series, written by The Syndicate’s Kay Mellor, has begun filming in London. Also cast in the show are Miranda Richardson, Zoe Wanamaker, Phyllis Logan (Downton Abbey), Anthony Head, Daisy Head (Guilt); Chris Fountain (Coronation Street); Steve Evets (This Is Us); Elena Saurel (Midsomer Murders); Thailia Zucchi (The Windsors); and Emmett J Scanlon. The series, which follows three friends struggling with the responsibilities that come with being a modern woman of a certain age, will be airing in six installments. Acorn Media Enterprises is the North American partner, suggesting that the show will eventually air in the US and Canada as well. Girlfriends is a contemporary story of Linda, Sue and Gail as they struggle with the responsibilities and inevitable changes that come with being a modern woman of a certain age… But true friendship remains the same no matter how many years have passed. After the dramatic and sudden death of Linda’s husband Micky, childhood friends Linda (Phyllis Logan), Sue (Miranda Richardson) and Gail (Zoë Wanamaker) find themselves back together again. Each has their own problems to face; from a looming divorce from the husband she still loves and the loss of a high-powered job through age discrimination, to juggling the endless responsibilities of their grandchildren and aging mothers. Matthew will be playing the Tom, the son of Zoë Wanamaker’s character, Gail. Gail, on the other hand, has received her decree nisi from second husband Dave. She has six weeks and a day to win him back before the divorce becomes absolute, but can Gail switch focus from wayward son Tom and grandson Ben to concentrate on saving her marriage? Particularly as Tom is newly released from prison, tagged, and needs her help getting his life back on track. Matthew has done some interviews over the past week to mark the premiere of Season Five on BBC Two next week. The first of which is from BBC itself, the full feature on the show can be read here. What has Drummond been doing since we last saw him in Series 4? Well Drummond and Mathilda have developed their relationship since the end of Season 4 and Drum has moved in to the Reid household and it’s a little difficult for him to begin with, stepping into Reid’s house and Reid’s bedroom. But he slowly comes around to the idea. What we’ll see throughout the series is that he helps Augustus Dove with a few little missions that he’s got and Drum is very, very helpful in that respect and he becomes Detective Inspector. Reid is also on the run. How does this affect Drummond and his relationship with Mathilda? It leaves Drummond in a very difficult position because he’s torn between his loyalty to the police – which has been his driving force for his entire life and has got him out of the slums – and his love for Mathilda, which is so strong. As much as she starts to come around to the idea that her father is an outlaw, she still cannot bring herself to betray him and she doesn’t want to see him caught. And Drummond’s not entirely sure either as to Reid’s guilt; the policeman in him is looking at the evidence, which is insurmountable. And he’s got superiors telling him this, that and the other, but he’s not an idiot and he can see inconsistencies somewhere along the line and also he knows Reid is a good man. He’s always been a bit of a hero to Drum, and so as much as he’s leaning towards believing that he is a criminal, he still can’t, in the early episodes he still can’t quite make that transition into completely believing that. Is Drummond conflicted when Jedediah Shine takes over in Leman Street? When Inspector Shine first turns up at Leman Street, Drummond’s still a Police Sergeant and he’s very unsure of how to deal with this guy; you know, he comes in and he’s brash and he’s rude and everything that he holds dear as a policeman is completely at odds with everything that Drum stands for, everything that on the face of it Augustus Dove stands for and everything that Reid and Drake stood for when they were in charge of Leman Street; it’s the antithesis to what we now hold as good policing. The idea of the jail not being full enough, you know, I mean the ultimate aim is to not have anyone in the cells so everyone’s law-abiding, but it isn’t how he approaches things; he wants to see the cells full of criminals; he wants to set an example, and he’ll plant evidence and he will beat up any kind of suspects for confessions: it’s everything that Drummond has been against for his entire career. He’s a very honest person and so to begin with he has no idea how on earth he can possibly work under this guy. Again this is another situation where he’s being pulled between two people: Shine’s telling him to get Mathilda to betray her father, and Mathilda’s desperate that she cannot do that and he’s just put in the middle of this impossible situation because frankly Shine terrifies him. And so yeah nothing is quite straightforward for Drummond this year; his home life is difficult; his professional life is difficult and he’s just trying to get by and be a good copper and actually he’s being played as a pawn in a game that is much bigger than he realises. What impression does Augustus Dove have on Leman Street in this series? Augustus Dove is I suppose the ultimate puppet master of Leman Street at the minute; he’s the one that’s pulling all the strings to get Reid to make sure that they are arrested and ultimately put to hang because they’re the only ones that know about Nathaniel and about Dove himself, and they’re the only ones that can implicate him. And so he needs them out of the picture or at least their credibility completely shattered that no matter what they say, they will not be believed. And everyone at Leman Street are basically tools for him to achieve those ends and Drummond’s relationship with Mathilda is highly valuable for Dove, who manipulates the situation masterfully and that’s ultimately why Drummond ends up upstairs as an Inspector, because Dove is aware that he can use him and once all of that power of being a Detective goes to his head, and he loses sight of being an honest copper, then that’s when bad things can happen. And Drummond, as much as he’s a clever bloke, and he is a good policeman, he also has a stringent belief in the chain of command and a belief in authority. Does pride play a part in Drummond’s actions in Series 5? Drum gets a little bit lost in the world of Leman Street; he starts off when Shine first arrives, completely at a loss as to what he’s going to do; how can he possibly continue to work under this man? We see him come to blows with Thatcher after Drum takes Mathilda’s side and ends up informing Reid of a potential capture, which causes embarrassment for Thatcher. It gets to a point where he’s literally at the end of his tether, he doesn’t know how he can possibly stay in the police station under these conditions, and then all of a sudden it flips and they realise how valuable Drummond actually is. And it’s Thatcher that goes on the dock as a Police Sergeant and obviously Drum becomes Detective Inspector and that power I think goes to his head. There’s the complete relief of suddenly having this position of authority that blinds him to the true reason why. He loses his way really and he talks down to Thatcher and he really enjoys the fact that he’s been promoted above him. How does it feel to be a part of the final series of Ripper Street? I feel really, really lucky to be here. I just hope that now we can give it the send off that it deserves, that after all the years that those guys have all put in that it gets what is required.